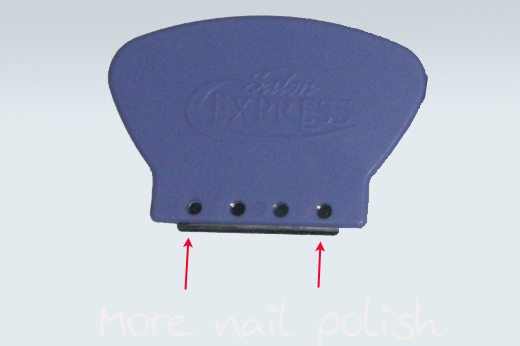 I was recently contacted the the PR company for Salon Express Nail Art Stamping Kit and asking if I would like to review the kit. These kits have been available in the USA for about 6 months, but they are soon to be available in Australia, in Target to be exact. This kit is one of those "As seen on TV" products, but I've never seen these on TV - although I would love to see a 30 minute infomercial about a nail stamping kit (instead of the Magic Bullet) - that would be so cool! Has anyone else see these advertised on TV. So here is the kit, it's all sealed around edges so at least you know someone can't open it in store and swap out plates. The kit includes five plates, a plate holder, a scraper and a double sided stamper. My first impression of the plates is that the single images are quite sweet, and there seems to be a few stamps with a similar theme, such as the butterflies and dragonflies, underwater creatures (turtle, seahorse and starfish) and flowers. The plate holder seems a little redundant, I did use it, but it didn't make the process any harder or easier, nor did it make the stamping process it any cleaner or dirtier. The first time I tried using the supplied scraper I found it didn't do a very good job and left the polish on top of the plate all streaky. It seemed to touch the plate where I drew the arrows below, but left a gap on the plate in the middle. So what I did was grab a piece of A4 paper and fold it up a few times to get some thickness, then I just scrapped over the paper, over and over again. I also gave it a very light file (using my nail file) along the edge of the metal. This seemed to condition my scraper and leveled the edge of it for smooth scraping. I know a lot of girls don't like using a metal scraper because it scratches you plate - instead they use an old credit card. I've personally never had a good experience with a credit card as the scraper, and the scratches on my plates don't bother me at all. So after this scraper had been "broken in" it was great. To test out the plate, scraper and stamper, I chose to use red Konad Special polish, cause I new it would show up nicely for the photos. Konad special polishes are great, but they are also expensive. If you are looking for some good stamping polishes, I recommend you get yourself Ulta3 Black Satin and Lily White (you can grab them in Target for $2). 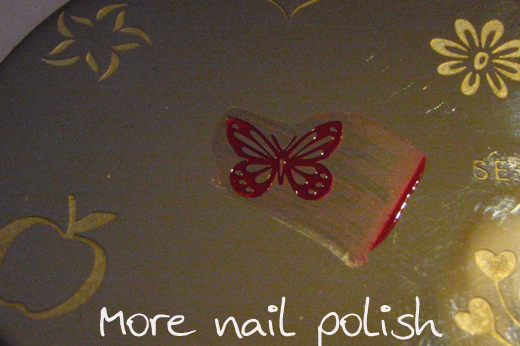 Both those polishes are excellent for stamping. 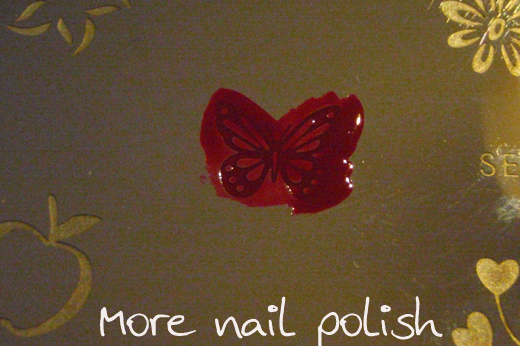 There are also a few other Ulta3 polishes that are good for stamping, Orchid and Gold Rush are two that come to mind. After just one swipe, most of the polish scraped away cleanly, leaving a good solid imprint in the plate. The plates seem to be deeply engraved, which is exactly what you need, because that way the polish doesn't dry too quickly and it is easier to pick up. Now to the stamper. 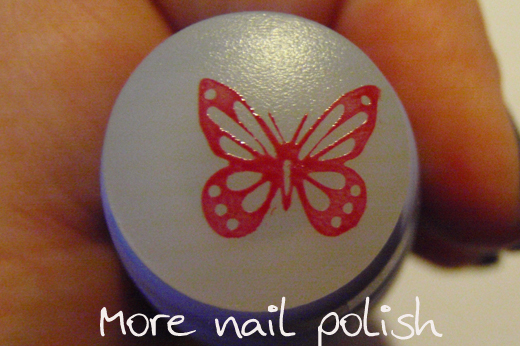 This is a great double sided stamper with one smaller and and one larger end. I normally use the konad double sided stamper and this one is just as good. 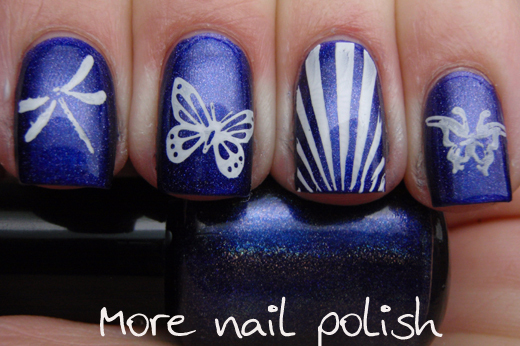 The stamp ends are nice and squishy, which makes it easier to roll the design both off the plate and onto your nails. I had no issues with the stamp picking up the polish, although they do say you can lightly buff the ends of the stamper if you have trouble with it not picking up your design. For my mani, I tried out a few different designs, all stamped using Konad special polish in white. I also tried out one of the full nail designs. To my surprise, as long as I was very careful placing the design, it was just large enough to cover my nail. If you have long or wide nails, these full nail designs would be too small. They are definitely too small for my thumb nails. My interpretation of this design is the butterflies and dragonflies, flying in the blue sky with the rays of sunshine represented on my ring finger. I Googled some designs made using the Salon Express Nail Art kit, and there are some good ones out there, such as this sweet palm tree one, this zebra print one and this nail polish ring stamped with the sea horse, to mention just a few. The Salon Express Nail Art Stamping Kit will be available in Target for $20. I think this kit is fantastic for anyone who wants to try out stamping and doesn't really know where to start. I wish these were around when I starting my stamping. I know I paid more than this to get some konad plates and the stamper. Now for the giveaway part. I was also lucky enough to receive three additional Salon Express Nail Art Stamping Kits to giveaway to my readers. As this is a new product in Australia and provided by an Australian PR company I feel its right to just open this one to my Aussie readers. To win, please leave an answer this sentence in the comments section below. "If I could design my very on nail art stamping image plate, I would put on it ...."
The prizes will go to the three ideas for a nail plate that inspire me the most. Get creative gals! Entries close on 30 June. I will post winners commenting name on an upcoming blog post. Winners must email me within two days, otherwise I will select another winner. "*Gasp* Oh my Gosh". Thank you, that was a good laugh!! If I could design my very own nail art stamping image plate, I would put on it a unicorn because I collect them and have never seen one as a stamped image. If I could design my very own nail art stamping image plate, I would put on it a mustache! Teehee, I love them and I think they are adorable and I think it would be pretty unique. Also to go with it I would put on a pair of geek chic glasses! There's a Cheeky plate with mustaches and lips/kisses. I would put awareness ribbon on it, zipper, corset, and a lot of lace full nail patterns. And Superman's symbol as well. If only they had the other Avengers' instead! Or Spider-man! If I could design my very own nail art stamping image plate, I would put on it lacy flowers. I am imagining something delicate in pastel colours with maybe a hint of sparkle. I'm dying to try this on! Looks great!! If I could design my very on nail art stamping image plate, I would do a plate of skulls. One whole nail stamp would be a series of parallel skulls (like the Sally Hanson Nail Stickers from Halloween last year), a bigger skull for an accent nail and a full skull and it's skeleton attached. That would be wicked. I've never had too much interest in stamping to go out and buy it online and spend crazy amounts on it but i think I might get this if it only $20. If I could design a plate it would have the image of an elephant on it also a large butterfly. "If I could design my very on nail art stamping image plate, I would put on it"... good luck charms such as a four leaf clover, horseshoe, dream catchers, #7 etc as every body needs some luck in their lives and it would be nice to be able to carry it about with you on your nails! Hi, I think there is a konad that has that already incase you didn't know :) Its on my wish list too. Oooh, the stamping came out very nice. I still haven't got a handle of stamping, and I don't know if it's me, the credit card or the plates (cause I got them for cheapies). But I really shouldn't blame my tools, so it's probably me. :( I would like to find out though! If I could design my very on nail art stamping image plate, I would put on it kitties doing a variety of things. So there would be one plate which you could use to fill all your nails with kitties that are sleeping, sitting, running, playing, eating, etc. I think that would be cute! I am pretty sure I have this set of plates in a similar kit like Kelz, so I wont enter the competition thanks but can I still tell you my plate? I would have medical related stuff, like a red cross, stethoscope,a radioactive sign, bandaids crossed over each other, pills and and even like a needle for a shot cool but creepy at the same time! Oooh, I like that idea! :) (I'm a Respiratory Therapist). If I could design my own plate, I would just put all my favorites on to one, so houndstooth, one of the lacey ones, a harry potter style (i would invent one), an anchor, a skull, and some cats :) I'm sure there are more too, but these are what I can't think of right now. Hi! Another Canadian over here! I found this exact kit in two stores in Atlantic Canada! "As Seen on TV" and "Showcase". They also had some other kits! if i had a chance to design a nail stamp plate i'll make one with cute teddy bears :)) thanks for this! I would put on a stamp plate an owl! I'm not in Australia, so I'm not entering the giveaway but have fun! 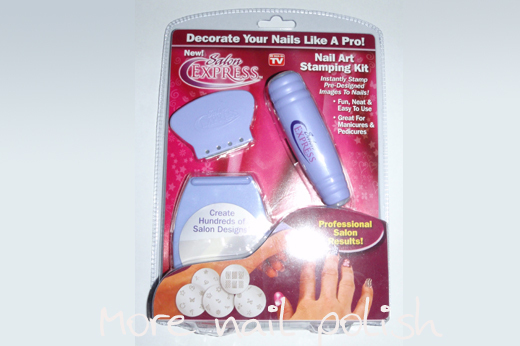 I have this set which i got at Walmart and I guess I just need to practice a little more because I can not get a stamp to transfer cleanly from the stamper to the nail at all. I have tried several different polishes hoping that I would find one that works as I do not have any Konad ones. I got one of these on Catch of the Day about 6 months ago and I'm still yet to try it! Since then two other people have given me them as presents - ha!! :P So maybe I should do a giveaway too!!! great run down of the kit target is doing all right! essence polish and now stamping kits what ever next! if i was to design my own plate i would have one with scissors,and other crafting designs as i am a crafter too. a needle and thread that looks like it goes through your nail would be cool too! and i would make them wide too as i have wide nails!!! I've seen these at target already, and im like OMG they sell konad! nice that its so easily accessible here now. This is a cute kit but $20? Are they following in the footsteps of every other brand over here that overcharges for cosmetics and nail polish? A double sided stamper and a couple of plates (fauxnad) could be purchased for less than $8 on one of those chinese beauty websites. THis is not an entry. I just wanted to say that I have this kit, it's cute. Somewhat functional, but nothing really special. For the price I paid for it here in the U.S. $6.50 at big lots it's great. It greatly upsets me knowing you ladies will have to pay $20 for the same thing I got for a third of the price. It makes me feel bad everytime I see yall paying ridiculous prices for the same beauty products we get here fairly cheap. Good luck ladies, it would be awesome for you to score this for free. I agree that I think $20 is a bit much for these plates, look at how many plates you get from Bundle Monster for about the same price.... Anyway...**If I could design my very on nail art stamping image plate, I would put on it my kids names, a dachshund, a chicken and my star sign symbol. That looks really good. I've wanted to try stamping for a whie now. If I could design my an plate it would definitely have a tardis on it! And an Apple symbol and anything else that was full of science fiction techie geekery! If I could design my very on nail art stamping image plate, I would put on it cowgirl/cowboy theme or forth of july. Oh never mind this is for Aussie's only!! Oops sorry ladies good luck! At the moment I have to order stamping geat online or trek ot Chatswood and find some little out of the way shop to find any stamping gear, so this is great news for beginners! I would love to see something for summer. Ocean Theme. Seahorse,seashells,mermaid,sea turtle,waves etc.. It would look so great with beautiful soft summer colors of aquas,greens and blue polish tones. How cute on your toes with summer sandals! 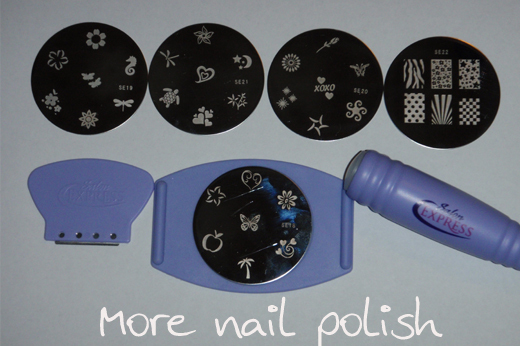 If I could design my very on nail art stamping image plate, I would put on it smiles. I have one of these! 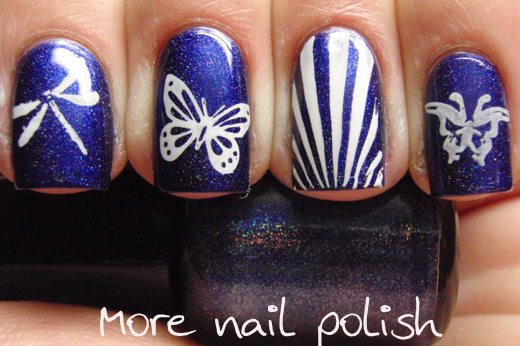 Creates such great nail art. Just wish there was a ladybug! Where can i buy this the link? ?